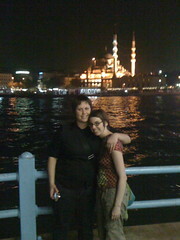 this is from the galata bridge. We couldn't figure out what mosque this was for a while, but we figured out it's the new mosque. it's right by the spice market- a few days later lisa took a video of us by the mosque during the day, feeding a cat ayran during the call to prayer.